ICU MSCRM: What Do You Want to Know About Integration? What Do You Want to Know About Integration? 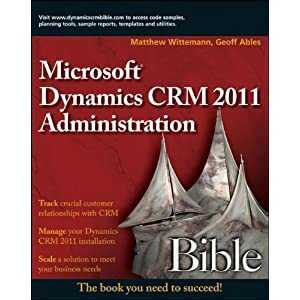 I'm hard at work wrapping up final chapters of the Dynamics CRM 2011 Administrator's Bible with my co-author, Geoff Ables. One of the final chapters deals with integrating Dynamics CRM with other systems. Integration can mean a lot of things, and I think the chapter is shaping up to be informative and helpful. But it occurred to me that you might have some good ideas and questions that you'd like answered. So, what do you want to know about integration? Leave a comment on this post to let me know. I think it could be interesting to dive into the the possibilities of integration around the online version of Dynamics, specifically how to use the Azure plug-ins to get the data out of CRM and into a locally hosted service using the service bus, providing a real time integration between the cloud and the internal LOB systems. That's definitely a hot topic for CRM 2011! We're going to be covering some of that in a chapter on server-side customization, and the SDK has a good amount of info and examples as well. Thanks for the suggestion, Eran! "I'd like to comment in relation to your article about 'What Do You Want to Know About Integration?'. It would be interesting to talk about what would be involved to integrate Dynamics CRM with Dynamics AX." Thanks for the suggestion, Sander! One the issues we have here at a enterprise level is deciding when to use data integration or application integrations. By this I mean, when do I use a Business Objects report and display it in CRM via IFrames or links and when do we actually integrate the data into CRM. To me it seems that if you want to do ad-hoc reporting the data must also reside in CRM. Other than that, use your enterprise reporting /data warehouse to sum the data and display the data via IFrames in CRM. Mark: I think you've summed that up well. That's the rule of thumb I follow: If your users need to create reports or do Advanced Finds, then the data needs to be pushed into CRM. Otherwise, CRM lends itself nicely to doing mash-ups and you can use external reporting tools or custom web apps to display data from other systems.